iTunes is a free app that runs on Mac, PC, iPhone, iPod, iPad and Apple TV. With it, you can organize and play digital music and videos on your computer. The iTunes player will keep your music, movies, and TV shows all in one place and move them onto any of your devices. You can play your whole collections whenever and wherever rather than go through piles of CDs. However, when you try to import AVI to iTunes on Mac for playing on iPhone or iPad, you may find that is not as easy as imaged. Actually, AVI is not compatible with iTunes. iTunes player only works with QuickTime movies and MPEG-4 files like MOV, M4V and MP4. Therefore, if you want to add AVI files to iTunes on Mac for playback or syncing to iDevices, an AVI to iTunes converter for Mac is needed. Aimersoft Video Converter for Mac is such a program. It is specially designed for Mac OS X (Mountain Lion) and can easily convert AVI to iTunes (iTunes 11) supported MP4, MOV, M4V format. In this way, you can transfer AVI files to iPhone, iPad, iPod and Apple TV via iTunes without any hassle. What’s more, Aimersoft Video Converter for Mac is built with a video editor, which lets you touch up the video as you like. Windows users please turn to Aimersoft Video Converter Ultimate. 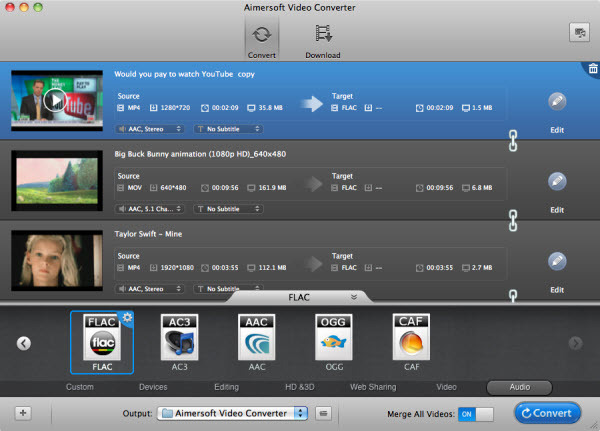 Aimersoft Video Converter for Mac is easy to handle, you can finish the conversion with a few simple clicks. For windows users, please learn how to convert AVI files to iTunes compatible format in Windows (Windows 8 included). Download and install Aimersoft Video Converter for Mac on your computer. Run it and directly drag and drop the AVI files that you want into the main window of this converter. You can also add AVI files by clicking the "+" button on the left bottom. Tips: This Mac AVI to iTunes converter supports batch conversion, which lets you convert multiple files at a time. If you want to merge all the imported videos to one file, please turn on the Merge button. The Output Format option is located on the bottom of the main window. Since iTunes only supports MOV, MP4 and M4V format, so in this step you need to choose one of them and designate it as the output format. What should be noted is that this video converter also offers optimized presets for iPhone, iPad, iMovie, Final Cut Pro, etc. Click the Edit button on the right side of the file and you can open the Editing window. Here you can adjust the video frame size, change visual effects, add watermarks and embed subtitles. This is an optional step. You can skip to the next step if you prefer the original video effects. After you coming through the steps above, simply click the Convert button to begin converting AVI files to iTunes on Mac. The conversion will be finish in a few minutes. When the conversion is complete, get the converted files from the default output folder and add them to iTunes. Now you can freely transfer your favorite AVI movies to iPhone, iPad, Apple TV, etc. via iTunes.